After three months of successful tour dates, including sold-out shows at Red Rocks Amphitheater in Colorado, Chateau Ste. 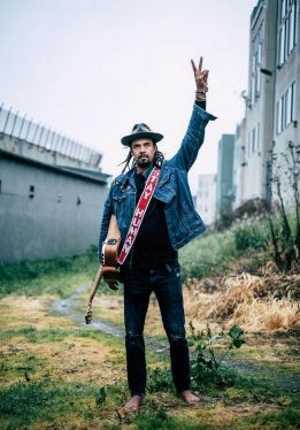 Michelle Winery in Washington state, Red Butte Garden in Salt Lake City, and Salvage Station in Asheville, N.C., Michael Franti & Spearhead are set to perform their Stay Human tour on Thursday, Oct. 4, 7 p.m., at The Paramount in Huntington. The tour marks Franti's new album, Stay Human 2, influenced by his self-directed documentary, "Stay Human," which has won an array of awards while on the festival circuit, including the RWJ Barnabas Health Award at the 2018 Asbury Park Music & Film Festival, the Audience Award at the 2018 Nashville Film Festival, the Audience Award and the Voice for Humanity Award at the 2018 ILLUMINATE Film Festival, and the Soul in Cinema Award at the 2018 Maui Film Festival. The film will continue to screen at film festivals this winter, including upcoming public screenings at the Woodstock Film Festival in upstate New York and the Mill Valley Film Festival in San Rafael, Calif.
As for his new album and film, Franti says the following: "I've traveled the globe making music and throughout the years I've always hoped that it could inspire small steps towards making the world a better place. Struggling with the challenges of the world I began filming my new documentary, 'Stay Human,' telling the stories of heroic, everyday people who helped me to discover more deeply what it means to be and STAY HUMAN." Franti began writing music as a way to process both the political landscape of the late 1980s and the unique sounds and ideas of his Bay Area upbringing. In 1994, he formed Michael Franti & Spearhead, a band that blends hip hop with a varriety of other styles including funk, reggae, jazz, folk and rock. While touring with his band, Franti continues to notice inequality and injustice both at home and abroad. The band released their seminal Stay Human album in 2000, reflecting on the unjust nature of the death penalty, among other themes, to make sense of our common humanity in juxtaposition to near constant violations of human rights. Franti released his first self-directed documentary, "I Know I'm Not Alone," in 2005 to widespread critical acclaim. The film depicts his mission for peace in the Middle East, with a focus on the human cost of war. Franti visited war zones in Iraq, Israel and Palestine, finding common connection and playing music to both soldiers and civilians regardless of affiliation. Michael Franti & Spearhead continue to foster the community both on and off stage. Franti and his wife Sara started a foundation, Do It For The Love, a wish-granting non-profit that brings those with life threatening illnesses, veterans and children with severe challenges to concerts. His recent musical projects have included the Billboard No. 1 single, "The Sound of Sunshine" (2010), and full-length releases, All the People (2013) and SOULROCKER (2016), which topped the Billboard rock album charts at No. 4 and No. 5, respectively. For tickets and more information about the concert, go to www.paramountny.com. The Paramount is located at 370 New York Ave. in Huntington.